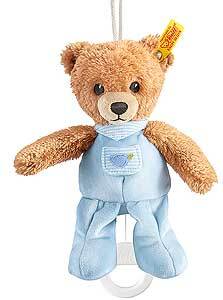 Steiff baby sleep well bear blue music box made of the finest cuddly soft blue plush. This beautiful piece wears the famous brass plated Steiff button in ear and carries the classic yellow ear tag. Product details: Steiff code EAN 239595, safety eyes, synthetic filling material, removable music box plays German folk song, machine washable, size 20cm. Safe for baby. 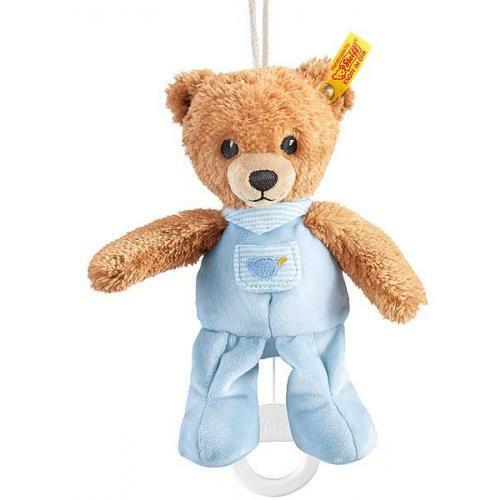 All textiles in the Steiff Baby toys and gifts range are tested for no harmful substances and certified by the standard Oko-Tex Standard 100 for child safety.